Power is supplied to the MCB900 board by an external 5-9 Volt DC power supply which is capable of providing 300-400mA. Connection is made using a standard 5.5mm barrel plug with a 2.1mm center hole. The center hole provides positive voltage. The voltage regulator (IC3) generates 3.3 Volts DC. 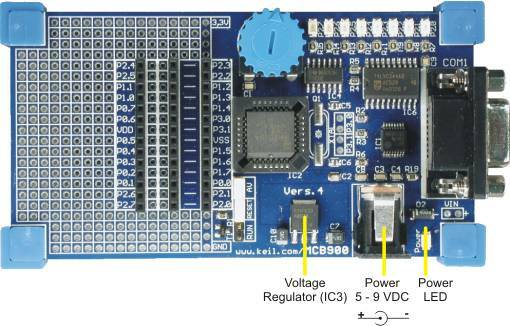 The Power LED indicates when power is applied to the board.